Home Fascination of Plants Day Fascination of Plants Day at University of Reading – 12 things plants do for us! 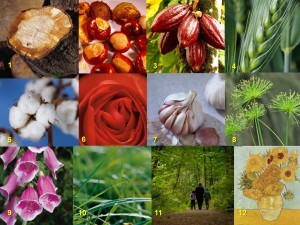 The twelve images from Dr M’s previous post celebrating International Fascination of Plants Day 2017 (here) represent twelve of the things plants do for us and Dr M spells these out below. For sure, there are many more than twelve things plants do for us, but this is a great starting point for appreciating the fascination and importance of plants in all our lives and in the life of our green planet! 1. Conkers: This is all about children and how they use plants in their play, conkers (bonkers conkers!) are the fruit of the horse chestnut tree (Aesculus hippocastanum). The first record of conkers as a children’s game was made in 1821. Try to think of other plants children regularly use in their play and learning. Fascinating conker fact: Q: When are conkers not a toy? A: When they were used in World War 2 to extract acetone to make explosives! 2. Oak tree: This is about the use of plants for construction, e.g. oak timbers have been used in houses and ships and as supporting beams in huge buildings such as cathedrals since Medieval times. But even today timber is still a material of choice for many state of the art architectural projects. For example, the Kings Place concert hall in London includes a performing space lined with oak veneer (from a 500 year-old German oak) creating a special and wonderful acoustic. Fascinating timber fact: only about 2% of a tree is actually living, the rest is dead and provides support for the tree, this is what makes trees so strong, Oak has greater tensile strength than steel! 3. Cocoa beans used to make chocolate: This is about economic uses of plants – tea, coffee and chocolate all globally significant cash crops, for example the chocolate industry is worth nearly 100 billion each year! Cocoa is the source of chocolate and the scientific name of the Cocoa plant is a small tree called Theobroma cacao, literally meaning the food of the Gods tree. To make chocolate the beans are harvested and thrown on the floor in the pulp and covered with banana leaves. The unique bacteria in the environment there ferments the beans and changes their flavour. Making cocoa flavour unique from one location due to the unique bacterial combinations. After this the beans are sun or oven dried. Then transported for roasting. Cocoa is mostly farmed on small holdings and as a result has great economic significance as a crop in these largely developing countries. Fascinating cocoa fact: Cocoa is a member of a tropical sub-family of plants called Sterculioidea which are named in honour of the Roman God of toilets, Sterculius, because they have very stinky flowers to attract insect pollinators! 4. Wheat: This is about crops and, of all the plants that humans eat, there are six which make up the bulk of human diets in different parts of the world: rice, wheat, soybean, sugarcane, maize and potatoes. Plant crops are vital to human economics and survival. The World population will reach 7.5B by 2020 and to feed the world we need to increase food production by 70% over the next 40 years. Plants must be a primary focus because animal production is inefficient. Plant scientists can contribute to feeding the world and the alleviation of hunger by developing plants that are e.g. drought tolerant, require less fertilizer, are more resistant to pathogens are more nutritious. Fascinating crop fact: Although there are probably around 300 000 edible plant species in the world, we routinely eat only about 200 plant species, and, even more amazingly, more than half of the calories and the proteins that we derive from plants are provided by just three crops: maize, rice, and wheat! 5. Cotton: this is about clothes and fashion – cotton and indigo are both plant products. Gossypium is the scientific name for the cotton genus in the plant family, Malvaceae, native to the tropical and subtropical regions from both the Old and New World. The genus Gossypium includes around 50 species and new species continue to be discovered. Fascinating cotton fact: The name of the genus is derived from the Arabic word goz, which refers to a soft stuff! Indigofera tinctoria, is the scientific name of the plant that was one of the original sources of indigo dye famous for colouring blue jeans. It now grows in tropical and temperate Asia, as well as parts of Africa, but its native habitat is unknown since it has been in cultivation worldwide for many centuries. Today most blue dye is synthetic, but natural dye from I. tinctoria is still available, marketed as natural colouring. Fascinating fashion fact: Q: Which family is the Indigo plant (hint: Jack had some of these). A: The bean family – Fabaceae! 6. The Rose: This is about gardening, Britain is well known as a nation of gardeners and the English garden is the envy of the world. Horticulture is one of the biggest leisure industries in world and in Britain the horticultural industry contributes around £9 billion to the economy every year and employs around 300 000 people in a range of disciplines. Fascinating garden fact: The oldest pot plant in the world is believed to be the enormous Cycad, Encephalartos altensteinii at Kew Gardens which was collected by plant hunter Francis Masson from South Africa in the early 1770s. 8. Papyrus: This is about plants and history. One of the historical activities that changed the course of human history is writing, the ability to write things down as a permanent record allows information to be passed from person to person, from country to country and from generation to generation. Writing can be done on walls, rocks or on wood but the writing of extensive documents is much easier with paper. Modern paper is made from wood pulp but the word “paper” is derived from the Ancient Greek word for the Cyperus papyrus plant. Papyrus is a thick, paper-like material produced from the pith of papyrus which was used in ancient Egypt and other Mediterranean cultures for writing long before the making of paper became widespread and developed in China. Fascinating paper fact: Q: What is the difference between papyrus and paper? A: Papyrus are plants pressed and dried, while paper is made from fibres whose properties have been changed by processes such as maceration or disintegration. 9. Foxglove: This is about plants and medicines, around 40% of prescription medicines are derived from plants. For example the bark of the white willow tree contains acetyl salicylic acid, commonly known as aspirin (used for pain relief for 2,000 years). The Foxglove (Digitalis purpurea) has been used since the 16th century to treat heart disease and its derivatives are still used in modern medicine. Fascinating herbal medicine fact: A herbal is a book containing the names and descriptions of plants, with information on their medicinal and other uses. The two best-known herbals in English were The Herball or General History of Plants (1597) by Gerard and The English Physician Enlarged (1653) by Culpepper. 10. Grass: This is about plants and sport, football rugby cricket and even lawn tennis are impossible without grass. Grasses have a very special growth form in which the main growing point (the meristem) is close the ground level. This contrasts with most other plants, e.g. in many wild flowers the meristems occur in buds at the end of the stems above the ground most dramatically in trees where the buds are on twigs and branches high about the ground. This explains why grass is so good for lawns because you mow it off and you don’t damage the meristems and it grows back every time! Fascinating grass fact: Grasses evolved in Cenozoic, ca 50 mya, at the same time as horses and because grasses were able to withstand grazing (unlike many other plants) they became very successful. 11. Forests – this image reminds us that plants make up habitats for animals and the conservation of biodiversity depends on plants as the building blocks of habitats and ecosystems. Forests are filled with many beautiful and important species of plants and animals and are iconic habitats for the global conservation movement. Forests also have a special place in the human psyche and we should not underestimate their significance for our well-being. Fascinating forest fact: The Japanese have a word for it, two words in fact Shinrin-Yoku – forest bathing. Scientific research has shown that walking in the forest can have many measurable health benefits including lower blood pressure, reduced stress, improved concentration, reduced depression and hostility, increased vitality, better concentration and increased creativity. 12. Sunflowers by Vincent van Gough: This is about the importance of plants in art and culture and aesthetics. Plants have been the stimulus for a vast amount of art, literature, poetry and music. Plants are often used as symbols in art, mytology, religion, literature and film, plants play important roles, symbolising fertility, growth, purity and rebirth. In architecture and the decorative arts plants provide many themes, such as Isalmic arabesques and the acanthus forms carved on to classical Corinthisan columns. Fascinating art fact: Much music has been inspired by flowers, and roses are probably a number one inspiration, no doubt due to their heavenly scent – though roses offer only fourteen distinct smells which is modest compared with over 400 for chocolate! Dr M says: This short journey around twelve ways in which plants matter to us represents the tip of the botanical iceberg! Plants are fascinating, beautiful and totally invaluable, the importance of plants in our lives and in the future of our planet cannot be overstated! Plant blindness is the inability to see or notice the plants in one’s own environment, even though they are all around us and much more present than most animals! We ignore plants at our peril! Have a nice day and please, thank a plant today! John Warren (2015). The Nature of Crops: how we came to eat the plants we do. CABI. Bill Laws (2010) Fifty Plants that Changed the Course of History. David & Charles. Richard Mabey (2015). Cabaret of Plants: Botany and the Imagination. Profile Books Ltd.